One of the things we love about destination wedding photography is exploring new cities with our couples - creating memories and images! Psychologists say that in the brain, memory is inextricably tied to place; documenting and subsequently viewing specific locations effectively triggers the positive feelings experienced at that place. I know that whenever I look at this photo, it takes me back to the feelings of fun and freedom experienced while shooting this incredibly happy husband and wife as they delighted in sharing their city with us. This image was taken in a courtyard that has been in existence for centuries. To add depth, layers, and contrast, the photo was shot through a contemporary sculpture in the middle of the square by Chris balanced atop a rickety cafe chair. To separate the couple from the background, we placed a Canon wireless 600EX-RT Speed lite off-camera flash on a Gorillapod behind them as they embraced in the doorway. The flash was triggered by a Canon ST-E3-RT radio transmitter mounted on Chris' Canon 6D full-frame camera body. 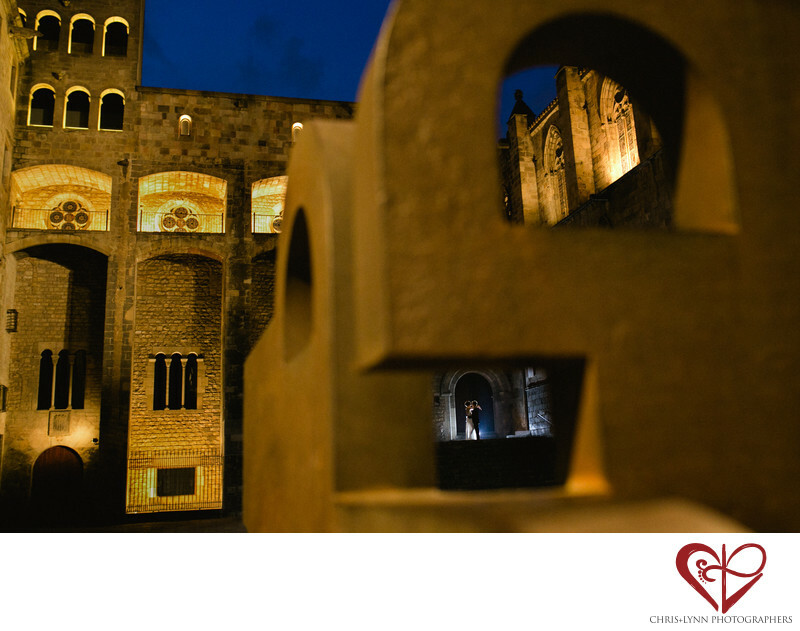 The Gothic Quarter, or Bari Gotica, a labyrinthine mashup of crowded squares & zigzagging pedestrian lanes and alleys, is our favorite location in Barcelona for engagement sessions and destination wedding portrait sessions. 1/30; f/2.8; ISO 1600; 35.0 mm.